The back view of the Indian Kshatriya warrior shows his turbaned head and stuffed torso. The Hindu caste system has four major castes, including Bhamin (priests), Kshatriya (warriors), Viasya (merchants), and the lowest caste is Sudra (peasants). The Kshatriya caste has traditionally been associated with warriors and rulers who protect the land from attackers and maintain order. In India, red has traditionally been associated with the Kshatriya caste; the figure is wearing a red shirt and red turban-like hat. This figure of a Kshatriya warrior has a hand-carved wooden head, and a stuffed fabric torso. 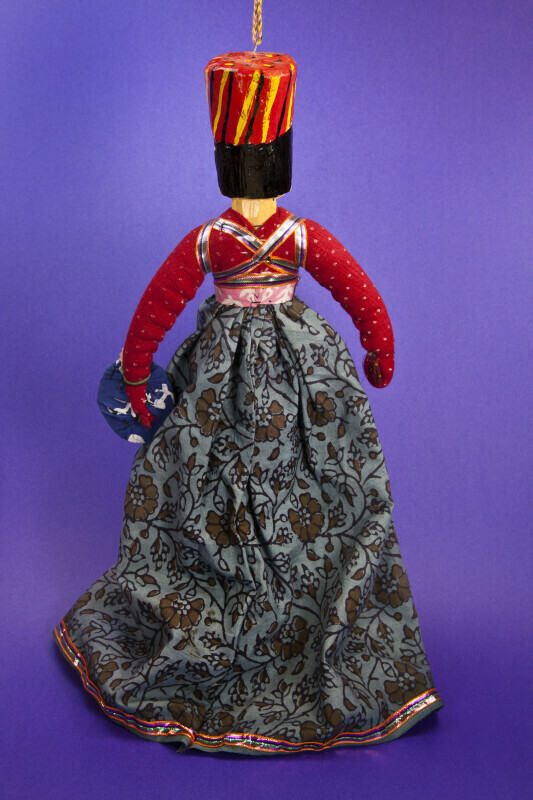 This figure stands 16 inches (40 cm) tall. WARNING: You are about to download a 36.9 MB TIFF!